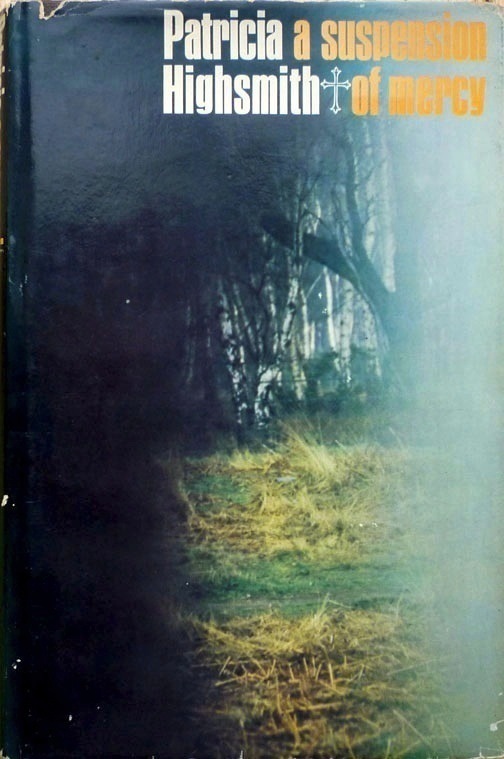 A Suspension of Mercy, her eleventh novel, published in the US by Doubleday in 1965 (under the title The Story-Teller) but seen here in its British Heinemann edition from the same year, dust jacket design by Tom Simmonds (who also designed the wrappers for the British first editions of Adam Hall's The 9th Directive, George V. Higgins's The Friends of Eddie Coyle and Peter Benchley's Jaws, among others). I've actually owned this copy of the Heinemann first for getting on for five years (I bought it on eBay in November 2009, and it's resided in the Existential Ennui Patricia Highsmith First Edition Book Cover Gallery since I set that page up last year), which may well be a record for the length of time between my buying a Highsmith book and finally getting round to reading the bloody thing. However, that shouldn't be taken as an indication of anything other than circumstance and happenstance, and in hindsight I realise I should really have read it last year, for the simple reason that large parts of it are set in the bit of Suffolk where the Day-Joneses vacationed last September – said vacation resulting in an interminable series of blog posts about the various secondhand bookshops I dragged Rachel and Edie to. The increasingly tense events which ensue are driven by Sydney's slightly odd actions and Alicia's reaction to them. In a confused interplay between his fiction and his real life, Sydney imagines killing Alicia, acting out the disposal of her body by burying an old carpet in some local woods ("to purge himself", but also in an effort to tap into the psyche of a murderer – John Christie is mentioned) – an act witnessed in part by Mrs Lilybanks (there's a clammy encounter between Mrs Lilybanks and Sydney at the novel's midpoint where the former accuses the latter of murder – Highsmith switching viewpoints from Sydney to Mrs Lilybanks so we see Sydney, entirely innocent – of murder at least; we learn he has hit Alicia "not severely" on occasion – as he appears to Mrs Lilybanks: profoundly guilty); in turn, Alicia's determination to stay hidden is bolstered by the involvement of the police in her disappearance – prompted by Sydney's carpet-burying activities – and her involvement with another man. Patricia Highsmith's biographer Andrew Wilson identifies A Suspension of Mercy "as the author's most postmodern novel", "a literary hall of mirrors in which reality and fiction are constantly reflected and, ultimately, confused". Beyond the obvious parallels between Highsmith and Sydney (highlighted by Highsmith herself in Plotting and Writing Suspense Fiction) – Sydney is an American writer, like Highsmith, living in Suffolk, as Highsmith was at the time she wrote the book – Wilson quotes Highsmith's friend (and Heinemann's advertising manager) Charles Latimer on a more specific correspondence: "Pat liked to act out things to see what they felt like. I remember she buried some snails in the woods behind her cottage to give her some ideas or emotions for A Suspension of Mercy." Anyone intrigued as to why Highsmith would have chosen to bury snails in order to conjure these ideas or emotions should head to Kelly Robinson's Book Dirt blog, but more interesting to me is the way that Highsmith's and Sydney's ad hoc grave digging prefigures that in Ripley Under Ground, in which Tom Ripley – the Highsmith protagonist who most closely mirrors her outlook – both buries a body (Murchison, the art collector) and is buried himself (by Bernard Tufts, the painter). And there are further Ripley parallels too, especially in the form of The Whip, the criminal character concocted by Sydney for a proposed television series. When Sydney initially conceives of The Whip, he determines that the audience should see "everything through The Whip's eyes", as Highsmith's readership does with Tom Ripley (largely; Ripley's Game is the sole exception); that they should do "everything with him, finally [plug] for him through thick and thin", as is the case, arguably, for most readers with Tom's adventures in the Ripliad. Additionally, The Whip, like Tom, knocks someone out on the way to the wine cellar (Ripley Under Ground and Murchison again, who is bludgeoned by Tom – admittedly rather more lethally – in Tom's wine cellar), and displays an aptitude for mimicry and disguise (The Talented Mr. Ripley, Ripley Under Ground) and even female impersonation (The Boy Who Followed Ripley). On top of all that there's the matter of one character's demise, a death for which Sydney is indirectly responsible – "caused by his attitude" as he muses to himself, much as Tom's "attitude" causes Bernard's death in Ripley Under Ground. 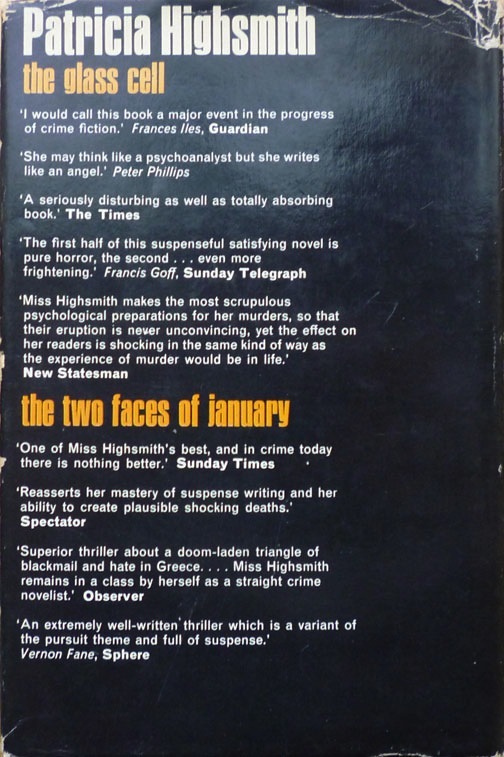 Highsmith's intention with A Suspension of Mercy, as she details in Plotting and Writing Suspense Fiction (she devotes quite a bit of space to the novel in that book), was to have Sydney "commit no crime at all, only be suspected of one or two". In fact Sydney's playacting does in the end result in three deaths – the third one, at the novel's climax, particularly unpleasant. Here again Ripliad enthusiasts might think of Tom, especially when considering Sydney's fate at the end of the novel, although for my money A Suspension of Mercy, though engaging and laced with black humour, doesn't rank with the best bits of the Ripliad (Ripley Under Ground, Ripley's Game). Andrew Wilson states in his biography of Highsmith, Beautiful Shadow, that "[w]hat Highsmith tried, but failed, to achieve with A Suspension of Mercy – the creation of a suspense novel that did not feature a murder – she succeeded in doing with her next book, Those Who Walk Away". Until I've finished reading Those Who Walk Away I'll have to take both him and Highsmith – who notes in Plotting and Writing Suspense Fiction that the novel has "no murder, no big crime" – at their words, but while I'm polishing it off, and to continue the recent Highsmith theme on Existential Ennui, I thought I'd take a look at a curious edition of not only my favourite Highsmith novel, but my favourite novel full stop: Ripley's Game. NB: For another take on A Suspension of Mercy, head to Olman's Fifty. What I don't like about British editions is that their dust jackets lack blurbs from Anthony Boucher. And you do at least get Frances Iles, of Malice Aforethought fame, on the back of A Suspension of Mercy. 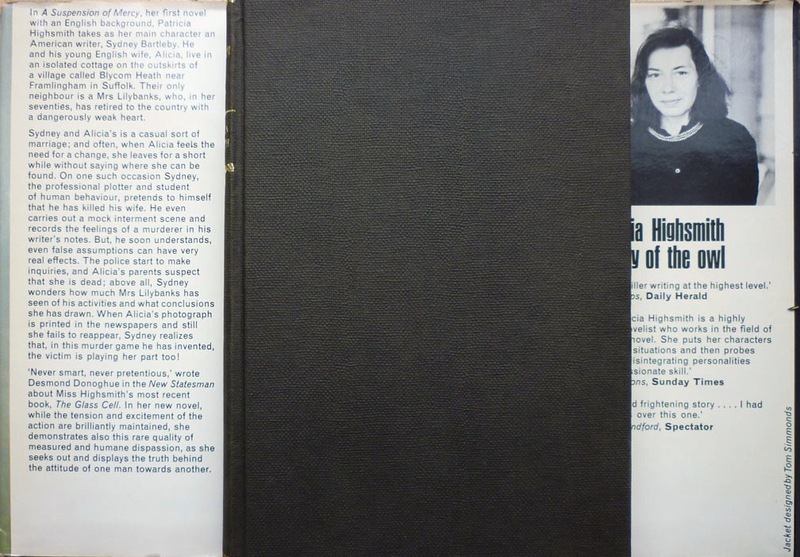 Highsmith was indeed very productive during the sixties and she seems to be working out all the permuations of a psychological murder mystery, one of them being the mystery with no murder, as you said. This is something she did again in The Tremor of Forgery, where the protagonist isn't sure if he's killed an intruder or not. I like how suspicions build from indefinite actions, such as Alicia's decision to stay hidden. This happens also in The Cry of the Owl, I seem to remember, when the protagonist gets in a fight with a romantic rival, and then the rival disappears in order to cast suspicion on the protagonist. Finally, the fictional creation of The Whip reminds me of the many, many comic book stories HIghsmiith created in the 1940s. She supported herself with this kind of work for more than ten years, I think. Anyway, very interesting stuff. Suffolk sounds like a nice place to wander around in. The Whip being a bit like one of the comic characters she worked on occurred to me too, Jorge, but not till this morning, after I posted the piece. Good point about The Tremor of Forgery too, which is my favourite non-Ripley Highsmith; reading Those Who Walk Away, the book which falls between Suspension and Tremor, it seems to me as if Highsmith is, book by book, edging further away from the suspense genre, until with Tremor she's simply writing a novel, with no concern as to whether it's suspenseful or not. Wow, thanks for the link to my post. I read A SUSPENSION OF MERCY before I knew about her snail obsession, so I never made the connection. I only made the connection thanks to Andrew Wilson's biography – and it was your excellent post which really brought home to me Highsmith's snail obsession. Since I had not read this book when you posted this piece, I only skimmed what you wrote. I just finished reading it tonight and upon fully reading your post must tell you I think it is a very smart assessment of the book. I had many of the same thoughts about The Whip, too. On the whole, I think I enjoyed ASOM more than you - I really liked this trick of not having a proper murder but yet still be terribly worried that Sydney would get caught out for it. (Reminds me a bit of Rear Window - was there a murder and will they get caught trying to figure it out?) And I made a note to look up Christie - but you helpfully had a link already in place. I can't believe I never knew about that case. I think I will tackle The Tremor of Forgery next. Andrew Wilson noted the link between The Whip and Tom Ripley before I did, BG, although I think I noticed it myself independently before reading about the novel in Beautiful Shadow (I didn't want to spoil it), and I think also I added the bits about wine cellar and mimicry (I don't have Beautiful Shadow in front of me to check). But anyway: thank you. I liked Suspension just fine, and on reflection maybe more than this review suggests. It's not one of Highsmith's very best, but it is very good.